Scientists say low marine survival rates threaten Puget Sound coho salmon populations. A 2015 article in the journal Marine and Coastal Fisheries reports that wild cohos in the Salish Sea had higher smolt survival rates over a 30 year period than hatchery coho salmon. Smolt survival in the Strait of Georgia during that time declined faster than it did in Puget Sound. Juvenile coho salmon. Photo courtesy of NOAA. 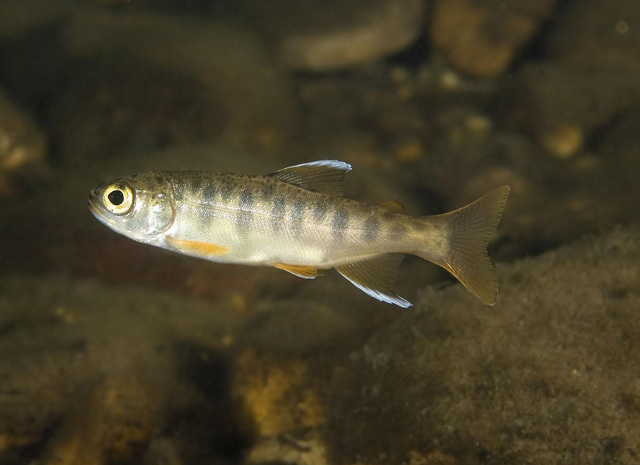 Understanding the factors contributing to declining smolt-to-adult survival (hereafter “smolt survival”) of Coho Salmon Oncorhynchus kisutch originating in the Salish Sea of southwestern British Columbia and Washington State is a high priority for fish management agencies. Uncertainty regarding the relative importance of mortality operating at different spatial scales hinders the prioritization of science and management activities. We therefore examined spatial and temporal coherence in smolt survivals for Coho Salmon based on a decision tree framework organized by spatial hierarchy. Smolt survival patterns of populations that entered marine waters within the Salish Sea were analyzed and compared with Pacific coast reference populations at similar latitudes. In all areas, wild Coho Salmon had higher survival than hatchery Coho Salmon. Coherence in Coho Salmon smolt survival occurred at multiple spatial scales during ocean entry years 1977–2010. The primary pattern within the Salish Sea was a declining smolt survival trend over this period. In comparison, smolt survival of Pacific coast reference populations was low in the 1990s but subsequently increased. Within the Salish Sea, smolt survival in the Strait of Georgia declined faster than it did in Puget Sound. Spatial synchrony was stronger among neighboring Salish Sea populations and occurred at a broader spatial scale immediately following the 1989 ecosystem regime shift in the North Pacific Ocean than before or after. Smolt survival of Coho Salmon was synchronized at a more local scale than reported by other researchers for Chinook Salmon O. tshawytscha, Pink Salmon O. gorbuscha, Chum Salmon O. keta, and Sockeye Salmon O. nerka, suggesting that early marine conditions are especially important for Coho Salmon in the Salish Sea. Further exploration of ecosystem variables at multiple spatial scales is needed to effectively address linkages between the marine ecosystem and Coho Salmon smolt survival within the Salish Sea. Since the relative importance of particular variables may have changed during our period of record, researchers will need to carefully match spatial and temporal scales to their questions of interest. Zimmerman, M. S. Irvine, James R., O’Neill, M., Anderson, J. H., Greene, C. M., Weinheimera, J., Trudelbe, M. & Rawson, K. (2015). Spatial and Temporal Patterns in Smolt Survival of Wild and Hatchery Coho Salmon in the Salish Sea. Marine and Coastal Fisheries: Dynamics, Management, and Ecosystem Science. Volume 7, Issue 1. DOI:10.1080/19425120.2015.1012246. Mara S. Zimmermana*, James R. Irvineb, Meghan O’Neillc, Joseph H. Andersona, Correigh M. Greened, Joshua Weinheimera, Marc Trudelbe & Kit Rawsonf; a Washington Department of Fish and Wildlife, 600 Capitol Way North, Olympia, Washington 98501, USA b Fisheries and Oceans Canada, Pacific Biological Station, 3190 Hammond Bay Road, Nanaimo, British Columbia V9T 6N7, Canada c 407-960 Inverness Road, Victoria, British Columbia V8X 2R9, Canada d National Oceanic and Atmospheric Administration, National Marine Fisheries Service, Northwest Fisheries Science Center, Fish Ecology Division, 2725 Montlake Boulevard East, 98112, Seattle, Washington e Department of Biology, University of Victoria, V8W 3N5, Post Office Box 1700, Station CSC, Victoria, British Columbia, Canada f Swan Ridge Consulting, 3601 Carol Place, 98273-8583, Mount Vernon, Washington, USA Published online: 26 May 2015.